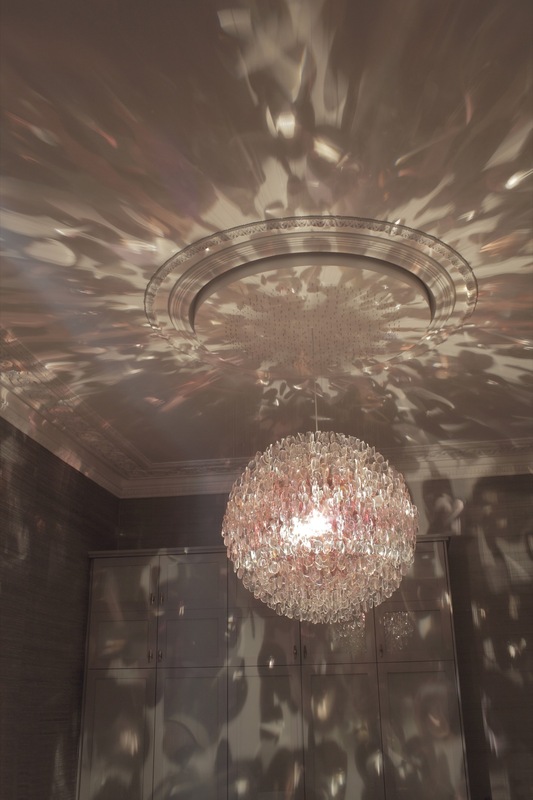 This piece is a further development on the original Optical chandelier from 2007, but is produced using tinted lenses. It is created from over 4500 tinted prescriptive spectacle lenses extracted from used frames. These lenses are meticulously categorized by their colour density in order to gradate the sphere from its core. Starting with the densest lenses at the nucleus of the sphere they gradually become paler until the outer lenses are virtually clear. This controlled mass of lenses forms a precise spherical shape with reference to a disco mirror-ball, but rather than the light being reflected the light is refracted through the many layers of lenses. In a similar way to a mirrored disco-ball there is an explosion of light which dances throughout the surrounding environment.